¶ 5 Leave a comment on paragraph 5 0 Luff and other philatelists believed that learning of some kind was inevitable when collecting stamps, even for those unaware of the process. That learning began, in this introduction with Luff reading a stamp, “let us take a postage stamp and consider it. ” He alerted the audience to examine the different elements of the design, and then to analyze the physicality of the stamp, including the paper, perforations, and gum. The process of observation led stamp collectors to read meaning into stamps, because a stamp was designed deliberately and required interpretation. Luff’s lecture was widely distributed in the early twentieth century and fellow collectors pointed to this book as an excellent primer for introducing stamp collecting to new audiences. ¶ 6 Leave a comment on paragraph 6 0 Collecting practices, then, made stamps good vehicles for teaching different skills or literacies. Knowledge of current events and political geography, for example, were often cited as benefits to philately. 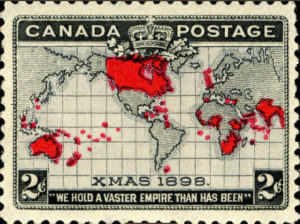 In 1894, one collector wrote that “stamp-collecting brings the situation of every important nation of the earth again and again through life to the mind of the collector.” Referencing the rapidly changing political landscape in south and central Africa amidst the “scramble” by colonizing European empires, philatelists saw themselves as more involved than the average person in current events because they followed international political developments in newspapers to keep up on new stamp issues. Newly-issued stamps often revealed who governed previously sovereign territories. In those cases, imperial governments not only constructed and enforced new territorial boundaries with infrastructure and military posts, but also through printing postage stamps that constructed new identities for people living in regions who weren’t necessarily culturally connected.2 These colonial identities circulated on stamps and became the identity by which collectors and stamp spectators associated with all living in those territories. 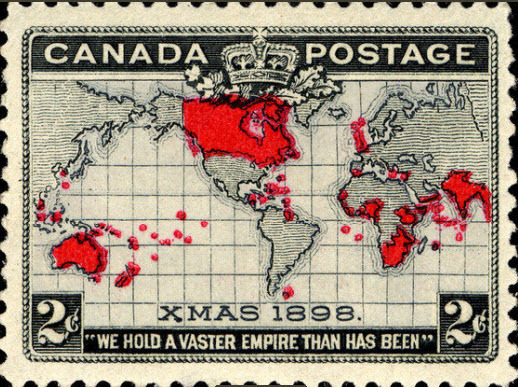 The needs of empire led to the creation of postage stamps in the 1840s, and sometimes empire was very visible on stamps themselves. ¶ 8 Leave a comment on paragraph 8 0 Collecting during this period of intense competition for power and sovereignty in Africa and Asia was exciting for philatelists because it meant new international stamps were regularly available for purchase or exchange. The mainstream and philatelic press constantly informed readers about newly-issued foreign stamps that held power to teach collectors about other countries. As debates and fears over immigration to the U.S. in the late nineteenth and early twentieth centuries ensued, using stamps to expose adults and children to foreign lands and cultures frequently framed the discourse. In 1910, one Washington and Lee professor praised stamp collecting for teaching geography, the expansiveness of British and European empires, and different systems of money.3. The Christian Science Monitor, which took an early interest in stamp collecting by sponsoring regular columns, consistently extolled the values of learning with stamps, particularly for keeping children in touch with events around the world and “political and social history.” Parents and children might examine a series of stamps that traced changes in governance, which contributed to the popular belief that stamp collecting taught geography, politics, and history. Collapsing empires, “belligerent nations” occupying territory, and newly independent states all represented the changing geo-political landscape during and following World War I.4. ¶ 9 Leave a comment on paragraph 9 0 Stamp collecting could have been used to generate greater cultural exchanges. With a large and growing immigrant population in the US, some groups could have connected the interest in stamp collecting, to learn about Italy, for example, from a native-born Italian. Collecting was about the stamps, however, and not necessarily about understanding the individuals or cultural history of the stamp’s originating locale. A collector seeking Chinese stamps in the 1880s might also fully support the Chinese Exclusionary Act. Collectors enjoyed gleaning small tidbits of information about a country from a stamp, which was just another product—or souvenir—from nations, empires, and colonies. ¶ 10 Leave a comment on paragraph 10 0 For some collectors the experience of viewing stamps was like being transported virtually to another nation. Images of foreign rulers, holidays, and landscapes carried one teenage girl to that country in her mind. She learned “everything that you would like to know about in any country” from its stamps. Anne Zulioff imagined the journey her stamps took from a printing press onto a precious letter, and then to land into her stamp album.5 In this example, small colored bits of paper acted as an agent activating the imagination. Adults and children learned to look at and read stamps as cultural objects embedded with meaning. That meaning was subjective. The history and culture Zuiloff described, was imagined.Teaching that global politics and cultures could be understood through the imagery and rhetoric of stamps, encouraged understanding the world in simplified ways.